The Leaning Tower of Pisa (with the Cathedral behind it). Pisa's cathedral campanile, or bell tower—far better know as the Leaning Tower—would draw crowds even if it didn't have such horrible posture. Its long cylinder of white marble threaded with the lithe arches of stacked colonnades make it one of the prettiest towers you'll ever see—albeit 15 feet out of plumb at the top. You can tell I took this photo of the long, winding staircase up the Leaning Tower on the downhill side, because the steps are worn toward the outside edge rather than in the middle, as they normally would be.The big engineering problem is that all that marble is too heavy for the shifty, sandy subsoil of Pisa, and it started listing right from the get-go in the 12th century. Attempts to correct its tilt during construction gave it a slight banana curve. The slant got so dangerous by 1990 that officials closed the tower to visitors, wrapped steel bands around it to keep the shear forces from ripping apart the masonry, and stacked unattractive lead weights on one side to try to reverse the lean by a few feet. By December, 2001 they deemed it safe enough to reopen to visitors—though if you expect to get in and climb to the top, you'd be wise to book ahead. Fabulous views from the top of the Leaning Towe.The climb is a bit strange, since that famous tilt means none of the slick stone steps are really flat. Half the time, they're progressively tilting downward, then they start progressively tilting upwards again, then it reverses yet again. I find it exhilarating, but it is also slightly disconcerting—and a good reason to take it slowly, especially coming back down when you get some speed behind you. Pisan scientist Galileo Galilei spent the 16th century observing the motions of pendulums (such as the low-hanging candelabra in the Pisa Duomo), asserting the Earth revolved around the sun, and dropping balls of differing weights off the Leaning Tower to prove they would hit the ground at the same time. Many people at the time thought he was kooky, and the church even excommunicated (and nearly executed) him for the blasphemy of suggesting the Earth wasn't the center of the universe, but today we know Galileo as one of the fathers of modern physics. You only get 30 minutes to climb the tower, take in the view form the top, and climb back down—but that's pretty much enough time. Note that you must pick up your tickets to the tower 30 minutes before your entry time—so, all told, a visit here takes at least an hour. Book your tickets ahead of time!!! You can also do just tower tickets online at www.opapisa.it (they no longer take telephone bookings—though you can call for information at tel. +39- 050-835-011). When you book your ticket, you pick an entry time to climb the tower (you get 30 minutes inside; children under 8 not allowed). To this you can add 1, 2, 4 (Nov–Feb, when the cathedral is free), or all 5 (in summer) of the other sights around the Campo to your ticket. You just pick the total number of sights you want, not the sights themselves; when you arrive, you can visit any of your choice of 2 or 4 or whatever, and can do so at any time (since you have to pick up your tickets at least 30 minutes before your Leaning Tower time slot, this makes a good way to kill time while you wait). Look it sounds complicated, but here's what you do: by everything. 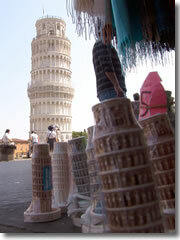 Book the Leaning Tower ticket, and then go ahead and buy the ticket for all the other sights. It's just not worth troubling over—especially not for a mere €10 (€8 in winter when the cathedral is free)—and they're all worth popping into. Note that you have a specific window in which you can book online: starting 45 days before your visit, but ending 15 days before your visit. In other words, if its two weeks before you arrive in Pisa, you're going to have to hope you get lucky and will be able to find tickets on the day at the ticket desk. That said, you could get lucky. Last time I visited Pisa, in the fall of 2009, I lucked into a last-minute cancellation and was able to get into the Leaning Tower with just two-hour's wait (which was perfect, since I spent those two hours seeing some of the other sights on the Field of Miracles). Again, I got extremely lucky. Hint: to avoid waiting in the regular Leaning Tower line, while booking tick the box that you want to pick up your tickets either at the Central Ticket Office or the Museo delle Sinopie. Get tickets at the Museo delle Sinopie. 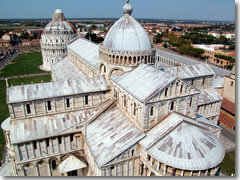 There is a single ticket for entry into all the sights on the Campo dei Miracoli. if you didn't book it ahead of time, make sure you buy it at the Museo dell Sinopie, which has the largest ticketing desk and the shortest lines. 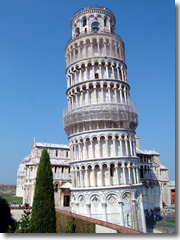 Unfortunately, the Campo dei Miracoli and Leaning Tower are a stuff 20– to 30-minute walk north of the main Pisa-Centrale train station. To get to the Leaning Tower from the main Pisa train station (Pisa-Centrale), first buy two bus tickets—due biglietti autobus—from a newsstand inside the station (one for each way). Exit the station, cross the little piazza out front, and cross the street to stand on the far side, a bit to the right of center—you need to do this because the city bus (www.cpt.pisa.it) you are catching goes both ways, and you want the one headed to the left (west)—otherwise, you're on your way to the airport! The bus you want is called LAM Rosso (the high speed red line, also abbreviated L/R). 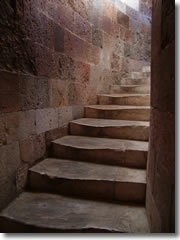 This will take you to the "Torre 1" stop just beyond the western edge of Piazza del Duomo (a.k.a. Campo dei Miracoli). If you happen to get off a train at the secondary Pisa-San Rossore station, you're in luck: it's just a five-minute stroll west of the Field of Miracles. Exit using the underpass of Piazza Fancelli. Walk straight ahead to Via Andrea Pisano and turn left. Walk three blocks. You can't miss it. If you arrive in Pisa by car , there's an amazingly convenient public parking lot just a block up from the western edge of the Campo dei Miracoli on Via Pietrasanta.